Systematically assess the key factors affecting primary interests (i.e., both nature and human well-being) in a socio-ecological system. Gain understanding of the drivers of conservation challenges and how they are connected to challenges for people. Understand the underlying evidence for the key factors affecting the challenges and opportunities for conservation interventions. Promote identification of novel conservation strategies aimed at systemic change. Situation analysis narrative and diagram. Documentation of evidence considered; documentation should be included with materials provided to peer-reviewers. What are the key challenges to nature? What are the key challenges to people and society? Where is there evidence for the strongest people-nature connections? Recruit a multidisciplinary and multifunctional team representing the relevant expertise and organizational functions (this might include managers, project staff with local knowledge, marketing professionals, government and corporate relations professionals, natural scientists, social scientists, and philanthropy staff). Include individuals from major stakeholder groups and partner organizations on the team especially if these partners will be needed to implement strategies. Expect to make some changes to team composition throughout the process, as different skillsets become more/less important for completing the work. Always aim for gender equity and multi-racial/multicultural inclusion. Be sure you include expertise to help the team assess primary interests for people and nature, gender equity integration, and, where appropriate, the interests of indigenous peoples and local communities. You may need external partners or colleagues to help you fill in the gaps. 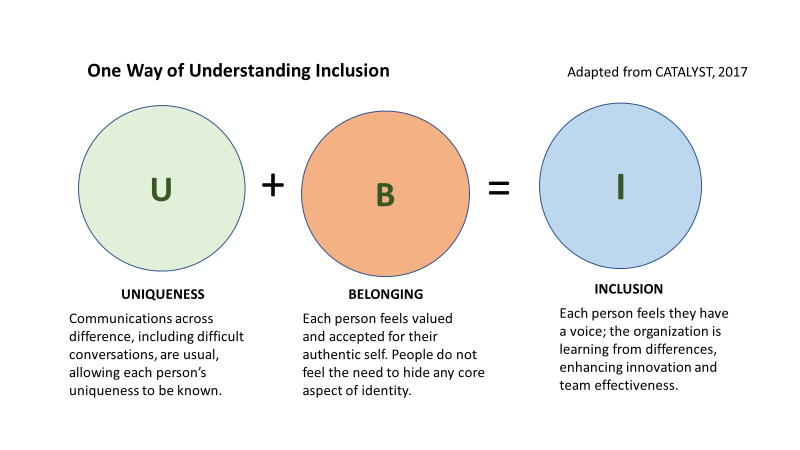 The Nature Conservancy’s Gender Equity Statement, Leveraging Difference Model, and Inclusive Group Norms Worksheet are all helpful tools for building diversity on teams. CCNet coaches and other experienced facilitators can help teams design and conduct participatory processes that will increase the likelihood that situation analyses represent diverse perspectives about the challenges and opportunities for conservation interventions. If you use a facilitator or coach, make sure they are familiar with the approach described here so that the facilitation leads to sound answers to core conservation questions and agreed-upon decisions. Team diversity and inclusion will make your team stronger. Adopt explicit team norms for inclusion. When forming a team or adjusting team membership ask “What differences are relevant to the work the team will do and the communities its work will address and/or impact? The Gender Equity Continuum Tool can help you understand the spectrum of ways that programs and policies may impact gender equity and equality. If working with partners is likely to be a component of a key strategy, then engaging them at an early stage is essential to gain buy-in and trust, especially if this is a new effort. When engaging partners, treat planning as a core strategy and joint priority-setting as an important step in implementing that strategy. 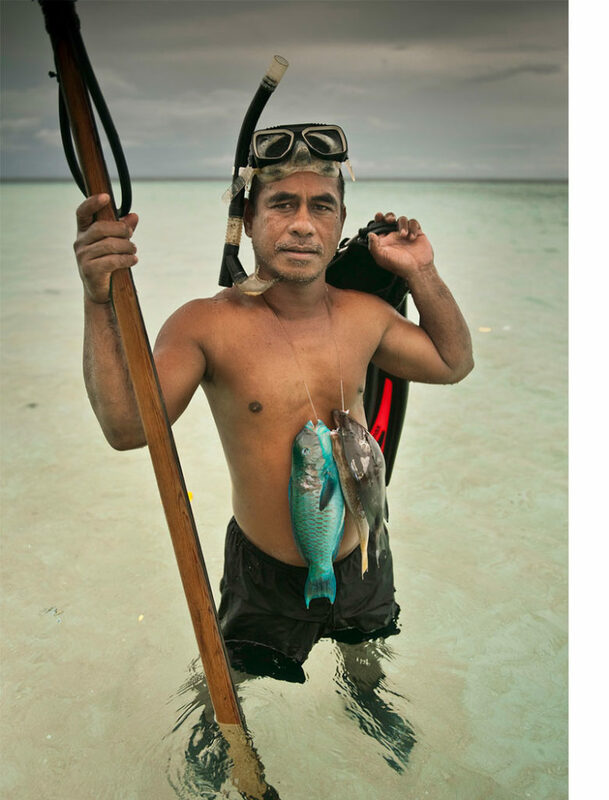 The Nature Conservancy’s Hawai’i marine program recently created a rich online resource, entitled Capturing Knowledge, to collect and share advice and tacit knowledge borne of decades of community-based marine conservation. While the Capturing Knowledge website was created with Pacific island communities and partnerships in mind, the wisdom contained therein can be applied anywhere. Additional resources and support can be found in the Conservation Partnership Center, which provides detailed guidance on negotiating and managing partnerships, and in Audubon’s Tools of Engagement. Develop a plan for stakeholder engagement. A full understanding of a socio-ecological system requires consultation with stakeholders that may have unique perspectives. Stakeholder engagement requires understanding the relevant situation, intra-stakeholder dynamics, and socio-cultural norms. It can be helpful to consider various approaches for engaging stakeholders, keeping in mind that engagement should be transparent and inclusive, and participation should be voluntary. Successful conservation outcomes require us to engage the many groups present in the communities where we work. Gender equity has a real impact both on conservation success and on improving the economic development and other human well-being outcomes for communities, regions, and nations. Include obtaining disaggregated gender data and stakeholder interactions as you organize your stakeholder engagement plan. The Nature Conservancy’s Gender Equity Statement provides some examples of how you might do this. Also include early assessment about whether or not indigenous peoples and/or their physical cultural heritage are part of possibly affected communities. If so, include engaging them in your plan, with appropriate expert help. A stakeholder engagement plan will identify how stakeholders are involved at each stage of the conservation process. Engagement can range from consultations at a few key points to full leadership of the conservation process. Through an approach developed in Australia by CCNet coaches called Healthy Country Planning ("HCP"), Indigenous Australians drive the planning processes involving their lands. HCP adapts the Open Standards to guide Indigenous communities through the process of making a plan to look after their country, culture, and people, and to identify ways to develop livelihoods while managing their lands appropriately. Have you planned for integrating gender and gender equity? Have you planned to assess whether or not Indigenous Peoples might be impacted? Here’s a link to the Social safeguard questions. This toolkit from the Spark Policy Institute is designed to help groups involved in policymaking and governance embrace the perspectives of nontraditional voices. The guide is designed to be succinct and practical, with overviews, discussion guides and checklists, including sample recruitment flyers, reimbursement forms, and other materials. Identify primary interests for both nature and people. Primary interests represent what the conservation organization, influential actors, and important stakeholders care about in the context of the socio-ecological system. For the Conservancy, primary interests begin with conservation targets (e.g. species of concern [endangered species], habitats, ecological processes [e.g.,water quality regulation, evolution, climate adaptation, etc.]). Conservancy staff should keep in mind the organizational orientation of aiming to achieve systemic change when selecting conservation targets as this will likely influence the number and types of targets chosen. At this stage the purpose is to identify all relevant interests for all involved. Primary interests of other organizations or stakeholder groups should also be included in terms provided by or accepted by these groups. These are likely to reflect a broad set of human interests (e.g. employment, income, food security, education, equality, access to resources, cultural sites, political instability/conflict/crime, urban growth, business opportunities). All identified as key primary interests should be included in the situation analysis. 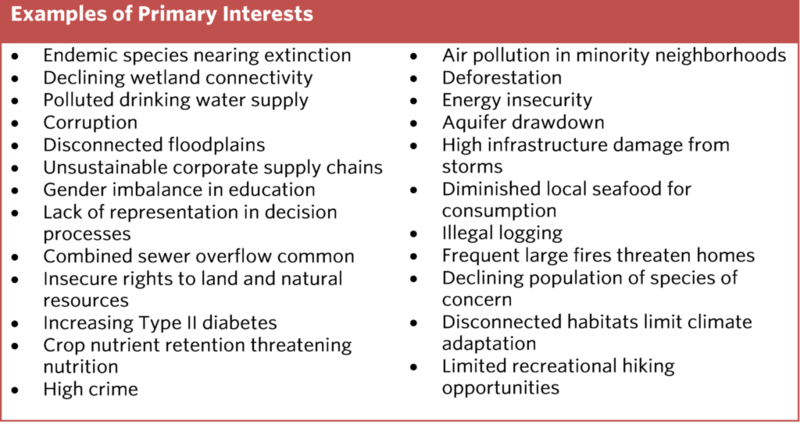 The point of the analysis is to identify which of these primary interests are strongly connected to conservation interests. Broadly defining primary interests early in the process allows representation of important values held by all key stakeholders that provide opportunities for identifying links or trade-offs between them. In many areas, ecoregional assessments have already been conducted that identify conservation primary interests (also called biodiversity targets; ecological systems and species) that are of conservation importance in an ecoregion. The Conservancy maintains a database of their ecoregional assessments here. When biodiversity primary interests cannot be identified from previous work, a threats analysis or a gap assessment can be used to identify representative biodiversity. Again, keep in mind the goal of achieving systemic change when identifying conservation primary interests. Use key informant interviews, focus groups, stakeholder analysis, and other tools to identify primary interests for people. When social or economic primary interests cannot be identified from previous work, common tools may be used to identify key stakeholders and their primary interests, or social and economic interests linked to biodiversity interests. These include key informant interviews, focus groups, and formal stakeholder analysis (e.g. WWF Stakeholder Analysis or Wongbusarakum et al. 2014), as well as many other kinds of social or economic analyses and syntheses. Additional guidance on selecting biodiversity targets can be found in the Open Standards, CCNet and Conservation Planning: Informed decisions for a healthier planet. Ensure that the primary interests of different groups, especially traditionally underrepresented or marginalized groups, have been considered. Identifying how the interests of underrepresented or other marginalized groups are part of the situation is essential. For instance, women are often at the forefront of natural resource management in developing countries, but are frequently excluded from decision-making processes. Low-income groups are often the most dependent on natural resources, and they may also face the brunt of environmental pollution, including in developed countries. Not including the interests of these groups can create an incomplete understanding of drivers, or root causes of conservation challenges and can create unintended consequences of well-intended conservation actions. When engaging with stakeholders to gain a better understanding of the primary interests for nature and people, seek disaggregated evidence by gender and for other vulnerable populations. Inquire about different ways in which the natural resources are used or impact groups of people, and differences in the human well-being factors, as well as any relevant or emerging challenges regarding equity. Equity is critical to consider when collecting data, as it helps with assessing primary interests, building accurate results chains, understanding possible unintended consequences, and how to gain buy-in and avoid harm. For more background on why gender equity is important, as well as some examples of how to address it, see TNC’s Gender Equity Statement. Be aware of, and avoid action based on, unconscious bias. Unconscious biases are human – we all have them. However, reducing such biases and avoiding acting on them is important. Accurate information can replace stereotypes absorbed earlier. Slowing down to notice a gut reaction, a judgment, an assumption, putting these reactions aside, then responding to the individual or group, can help. Obtaining accurate data and questioning assumptions is crucial to help you understand the primary interests for people and nature. You can use these Four Questions to help yourself catch bias and deflect it. Consider equity of participation (Voice, Choice and Action), impacts and outcomes among affected communities and vulnerable populations within communities. Stakeholders should be engaged in a way that respects their culture, resource and time constraints, and their preferred medium to ensure effective participation. However, sometimes marginalized groups may not be organized, and it can be challenging to find an effective way to engage with them. In these instances it may be helpful to focus on established community institutions, such as churches, schools or other civic institutions, as a first step to active engagement. How do you effectively engage external stakeholders in this process? Have stakeholders act as peer reviewers for the relevant pieces of the situation analysis. Interview external stakeholders as subject matter experts to help determine challenges to people and nature. Be willing to meet stakeholders where they are (physically and emotionally) instead of simply bringing them into your process, buildings, plans. Make use of previously identified primary interests. Look for existing science-based or socially-inclusive priority- or goal-setting processes that have already identified primary interests. Priorities defined in separate processes may save both you and stakeholder's time and resources. For instance, non-profits, government planning processes, development organizations, scientific bodies, and industry groups may have produced ecoregional assessments, development goals, future trajectories, or priorities that may be relevant as primary interests. Diagram relationships between primary interests and drivers of change that create challenges as well as opportunities. The team should not make any decisions yet about which links are important or strong or can be altered, instead identify all links within a system that make it work the way it currently does. Do not consider any possible strategies yet. This step captures the world the way it is now, not how we'd like to change it. Be sure to include relevant emerging factors. Demographic, economic, political, technological and environmental factors all may affect the situation analysis. Attempt to identify the emerging factors that could strongly influence the situation analysis, such as impacts from and responses to climate change, new energy and agricultural technologies that will affect land use, and population growth. Include these factors in the situation analysis diagram. Not all primary interests will be connected to each other, and not all social or economic primary interests will be connected to conservation primary interests. The point of the situation analysis is to identify strong drivers of primary interests, and strong connections between social, economic and conservation primary interests. A situation analysis diagram visually captures the relationships between primary interests and their primary drivers of change. Current negative connections between environmental conditions or drivers and human outcomes are critical to identify for later risk assessment and strategy generation where efforts can be made to avoid and mitigate risks. Include all human well-being interests that are meaningfully linked to the environment, regardless of whether they were initially identified as a primary interest. For example, you may have identified intact forest ecosystems, spotted owls, reduced fire risk and improved water quality as primary interests. In diagramming the links, you realize that forest fire also creates smoke and increases people’s risk of respiratory disease. This is a human well-being impact that is meaningfully linked to nature. Thus, respiratory health would be a new human well-being component to include that was not an initial primary interest. Include any key links between climate, environment and people, especially where climate change threatens human well-being and conservation primary interests. Consider both how primary interests are currently or may be affected by climate change and whether there are opportunities for adaptation and mitigation. Tools for creating a situation analysis diagram. Follow these steps to create a situation analysis diagram. If you have not done a situation analysis before, or have largely done them in the past with a focus on conservation primary interests, these steps may be a helpful way to go through the process. Start by listing the primary interests, both conservation and human interests. Write all of the primary interests in a column in the middle of a whiteboard, or using sticky notes on a wall, or on a large piece of paper. From each primary interest as a starting point, draw links to the left reflecting specific direct drivers of current challenges to the primary interest. Return to the primary interests, and draw to the right any direct environmental, social or economic outcomes of the current state of primary interests. For example, if declining urban forest extent is a primary interest, it could be driving population declines of species of concern, contributing to local temperature increases (both direct environmental outcomes) and reducing opportunities for urban recreation (direct social outcome). Then add further to the right any indirect environmental, social or economic outcomes of the current state of primary interests. Continue these pathways until you have considered whether each may end in a social or economic outcome. It is likely that all will either through ecosystem service pathways or through intrinsic value. Continue drawing factors (drivers and opportunities) and links until your diagram includes all the relevant actors and stakeholders. You may find in this process that some primary interests are drivers or outcomes of others. This is the nature of complex socio-ecological systems, and these linkages help us see which conservation and human primary interests are connected. Primary interests may also be connected by shared drivers. Keep in mind that the purpose of this exercise is to start the exploration of the socio-ecological system, and the primary interests do not need to remain in any specific orientation through this process. Figure 5, above, is an illustrative situation analysis for wind energy development in the Central Great Plains that includes many of the attributes described here (e.g., primary interests, direct and indirect drivers). 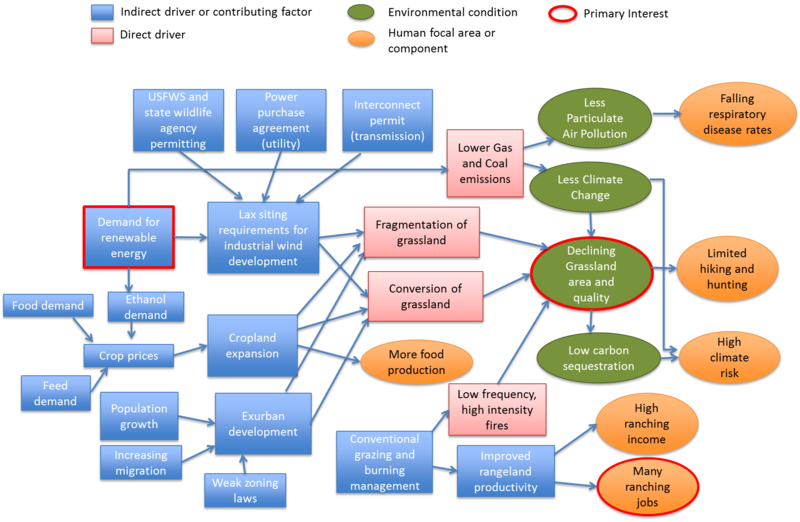 In Phase 2 of CbD 2.0 (map strategies and places) strategies are generated by considering intervention points and how the actions of actors could be altered to benefit the conservation and human well-being interests, so this step should include the current influence pathways of all the actors you may seek to engage with your strategies. Consider a wide list of direct and indirect drivers, including economic and market forces. Start by doing an assessment of the socio-economic context, as this will inform your understanding of the market forces and economic drivers affecting the conservation and human well-being interests that you identify. Use the framing questions provided below as a resource to help brainstorm these drivers. Seek expert input as you identify drivers. Engaging a wide range of experts can help ensure that you do not overlook less obvious drivers such as economic and market forces. If you do not have all relevant expertise among team members, you should seek additional expert input to the situation analysis. How do you avoid exploring a plethora of primary interests to people and nature? For TNC staff, make sure that the challenges are aligned with the shared conservation outcomes for your region. Have a smaller group of experts conduct a literature review and interviews for challenges to people and nature. Narrow down to "top 3" challenges to people and nature. With the larger group, determine drivers and narrow down priorities. How do you incorporate future trends? Include an analysis of socio-economic and market context. An analysis of the historical socio-economic context will inform your understanding of the market forces and economic drivers affecting the conservation and human well-being interests that you identify through your situation analysis. It will also help to identify potential changes in socio-economic, political, and management practices that could affect these interests. Using the following framing questions, create a list of direct and indirect drivers that connect to each primary interest. 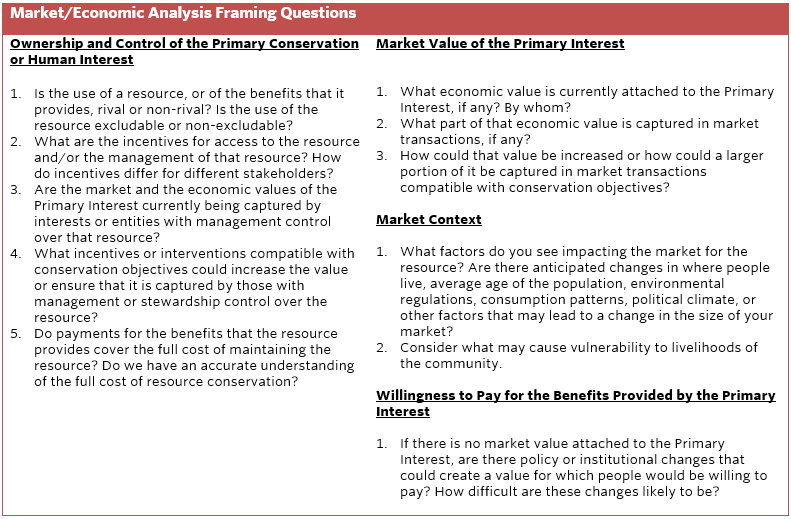 After going through the market driven framing questions, the team may be able to identify market forces and economic drivers in the situation analysis. Note that the indirect drivers (or contributing factors) should include not only threats, but also opportunities when applicable. The main economic drivers identified can now be added to the situation analysis. Represent social and economic interests in terms of specific human populations. 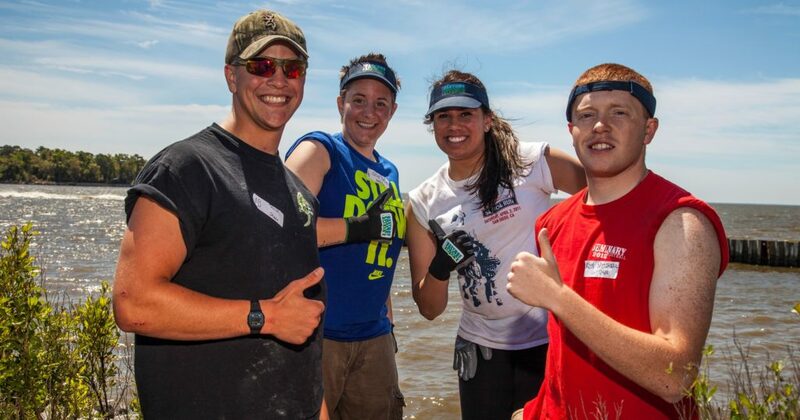 There is seldom a conservation activity that will affect all people, so it is important to specify the relevant groups for each human well-being primary interest. Relevant groups are the people evidence suggests are connected (positively or negatively) to primary interests as drivers or recipients of outcomes. Being clear in the early stages of the planning process about which specific groups may be affected, and how groups differ as drivers of change or as recipients of ecosystem benefit or harm, is critical. Populations are diverse and people can be grouped in many different ways, such as gender, income level, ethnicity, race, representation (marginalized groups), age, political orientation, and economic sector (e.g. corporations, herders, fishers, agricultural producers). The point in identifying relevant groups is not to attempt to reflect all groups, but rather to explicitly identify which groups of people are likely to be affected or influential so they can be considered and engaged as appropriate in the conservation process. We provide several examples here where the relevant groups are identified in italics. In a river whole system, current water pollution may not affect all people in a watershed equally, but disproportionally impacts downstream water users. Land conversion can impact many groups of people. For example, in a developed country context, current land conversion for high end housing development may benefit upper class residents and create jobs for construction workers, but reduce public access to park land for local residents, and may especially block access for recreational or subsistence fishing by low-income residents. In a developing country context, illegal logging may be providing illicit income to transient residents, while lowering access to fuelwood and limiting income and resources for local women, and reducing access to medicinal plants for local communities. Being as specific as possible in this stage will help identify key stakeholder groups, and will help in the generation of strategies in the next step. What can be done if you lack resources to incorporate evidence-based social science into your analysis? Talk to social science experts from local universities or partner organizations. Have a social scientist participate in the drafting of the situation analysis. Collect diverse types of evidence you collect, including from non-traditional sources such as health agencies or socially-minded organizations. Represent impacts on people (i.e., human well-being interests) in terms of specific human well-being components. It is impossible to draw defensible links between the environment and broad concepts of human well-being such as 'improved livelihoods' or 'healthy communities.' Refer instead to the Conservancy's suggested human well-being focal areas and their specific components to identify more specific human well-being interests. As much as possible, describe the primary interests of people in terms of specific components, and specify drivers and outcomes in as much detail as possible. For example, in Figure 5 specific human well-being components, e.g., income, insufficient governing rules [poor regulation], etc., are identified for an illustrative situation analysis for wind energy development. Review and synthesize evidence to ensure all major links have been represented. Refine work based on evidence assessment. By reviewing existing evidence, the team may learn that a link is not supported, or that the connection is between more specific elements of the system. For example, an initial diagram may link urban trees with air quality. Assessing evidence may reveal that urban trees are only known to affect some components of air quality like particulate concentrations and ozone, and the diagram should be updated to reflect these specific links. Consider diverse sources of evidence. Scientific literature, including peer reviewed journal articles as well as books and grey literature, as can be searched via online databases such as Google Scholar or other search engines that may be available through academic partners. Internal staff expertise. Knowledgeable staff from within your organization should be consulted to identify evidence that they may be aware of, including unpublished reports or data. These staff should also help identify relevant external experts. External expertise. It is always advisable to identify at least one external expert to ensure you have not missed any evidence, and it is essential when internal expertise is thin. Local experts and stakeholders. Local knowledge includes traditional knowledge and the experience of those that work directly with natural resource management or extraction. As this knowledge may not yet be written down, interviews will often be required to obtain this information. Searching scientific databases and consulting a handful of internal, external and local experts need not take an inordinate amount of time. Focusing only on relevant links and pathways can drastically reduce the time, effort, and quantity of evidence you will have to synthesize. Clarity on the question you are trying to answer will also speed your search for evidence. For each link in the situation analysis diagram, questions should be simple enough to answer with one or two sentences. For human well-being questions, identifying the relevant subpopulations (e.g., ranchers, indigenous communities, the urban poor) is good practice, and can speed your search for evidence. What do you do when there is not a wealth of peer-review data to rely upon to do your analysis at appropriate scale? Use best available information (experts, journal articles, disaggregated data, etc.). Document so that it can be refined in the future as new data becomes available. Don't use numbers as the only way to prioritize evidence. Include concepts and future trends. Convert what you can to percentages and look at magnitude. Be willing to do subjective prioritization using qualitative and single-story data. Validate the situation analysis diagram with key stakeholders and external experts. Seek external review once the team is relatively confident that they have created a comprehensive view of the situation incorporating all primary interests and related drivers of change and outcomes. Both internal and external peer-review and stakeholder engagement should occur to ensure that the assumptions made, causal pathways identified, and human well-being priorities identified are considered an acceptable representation of reality by the diverse set of stakeholders that are likely to be impacted by subsequent implementation. It can be helpful to consider the social safeguard questions before engaging with stakeholders. Some stakeholders may lack the time to review a comprehensive report, while others may lack the literacy skills to independently read these reports. When engaging stakeholders choose a location where they are comfortable and at ease, be respectful of their cultural traditions, and ask for feedback in their local language. Some historically marginalized groups, such as women or cultural minorities, may require extra considerations to ensure participation. For example, do not expect low-income residents to be able to attend or to fully speak up in a dominantly middle- or high-income resident city hall meeting, or women to provide contradictory views in the presence of male leaders in a strongly male-dominated culture. Synthesize evidence to identify strongest pathways of influence for each primary interest and narrow in on key challenges impacting the most primary interests. Situation analysis diagrams often become large and messy. These are complex systems, after all! This is a critical step where the goal is to identify the strength of connections you have so far identified in your diagram, ensuring that the dominant drivers of the current condition are agreed upon and represented. It may be helpful to represent the strength of each pathway by changing the weight of arrows that connect them, using different colors or using some other means to emphasize the stronger pathways. Allow the evidence to guide challenge selection rather than preference or familiarity. Avoid focusing on challenges that are associated with many weak links in the system, as influencing these, even effectively, is unlikely to lead to systemic and create lasting change for conservation. Synthesize available evidence to help ensure all major links in the system have been identified, and to indicate which are strongest. Use any available information, from stakeholder knowledge to secondary data, peer reviewed publications, key informant interviews, power analysis, or other methods to understand the strength of each pathway of influence in the current situation. For example, fish populations may be influenced by climate conditions, habitat condition, predator abundance, artisanal fishing, commercial fishing and recreational fishing. These drivers are unlikely to be equally powerful in determining fish population size and stability, and evidence from local fishers, fishery stock assessments, landings data or other sources should help identify which driver or drivers are most important. The most important driver(s) will be captured as key challenges in the next step. These tools can help you synthesize evidence. Tools such as “objective hierarchies” and “ends-means networks” can be used to evaluate and clarify relationships, synergies, and conflicts among primary interests. Social scientists, policy experts, and economists use additional tools, including “policy decision process flow charts,” “commodity value chain diagrams,” “trade maps,” and others. A number of analytical tools are available for free or at modest cost via the Internet. Elevate and summarize the biggest conservation challenges and linked social or economic challenges to take forward. Discuss within the conservation team, and externally with additional stakeholders as relevant, to narrow in on a few (we recommend 3-5) key challenges that will be taken forward into the next stage of planning. Key challenges are those that incorporate multiple conservation primary interests, their connected social or economic primary interests and their most powerful drivers of change in the current system. 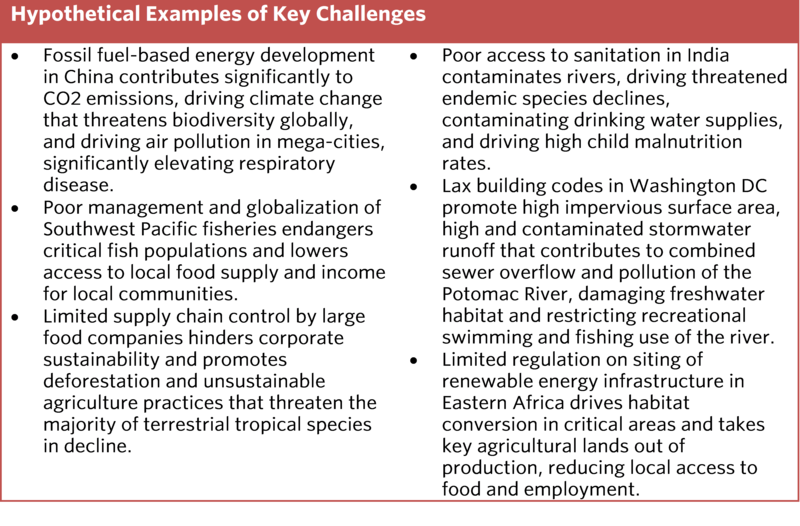 The language used to describe key challenges may or may not include reference to specific primary interests that were identified to start the process. Key challenges are best stated as the connected set of current conditions that create current challenges for a majority of primary interests. Not all primary interests will be captured in key challenges. The situation analysis is a focusing exercise that allows the team to take forward the most critical challenges in the system, not all of them. At this point, do not eliminate significant challenges for which no strategies are apparent, as strategy development occurs in a subsequent step. There may be social or economic primary interests in the system that are not strongly connected to conservation primary interests. These should not be elevated as key conservation challenges, as they are not defensibly linked to conservation issues. Key challenges chosen to take forward may include strong links that lie outside the expertise of the planning team or existing partners. Evaluate whether the conservation team requires additional expertise or partners. Consider filling gaps through consultants, partnering or other collaborations. Section Two of the Conservation Partnership Center provides a suite of tools, templates and examples that you can use to identify expertise gaps and to identify and evaluate potential partners. Do the planning team, partners, key stakeholders and relevant experts agree that the situation analysis diagram is a reasonable reflection of the current conditions and provides a common understanding? Have the following vague terms been replaced with specific conservation primary interests or components of human well-being: health, community well-being, human well-being, resilient communities, livelihoods, biodiversity, environmental health, thriving communities, social benefits, economic benefits, etc.? If you have any human well-being endpoints that do not specify a relevant group, did you consider whether all people are equally affected? Do at least some linkages in the situation analysis diagram reflect unexpected or newly identified connections in the system? (Even in systems we know well, it’s very unlikely that we know everything important that’s going on. If you learned about no new links from this process, your situation analysis was likely not broad enough and should be revisited). Does evidence confirm that selected key challenges relate to strong linkages in the system? Don’t throw out new linkages just because there isn’t a strong evidence base – flag this for further exploration and evidence collection. Does the diagram show how key challenges are connected both to nature and to some specific components of human well-being? (Even if human well-being is not a primary interest, it is highly unlikely that conservation primary interests are in no way connected to people. Revisit the diagram with additional experts if needed to ensure plausible pathways between nature and people have been fully explored).